Bubbles has been asking me for the last few days if it was Valentine’s Day yet. In order to smooth the transition after Christmas, I kind of talked up Valentine’s Day and how it wasn’t that far away, and that how after Valentine’s Day it would be her birthday. No need to be sad about taking down the Christmas tree, because we had two other reasons to decorate. So far she’s colored a number of construction paper hearts which she then taped to the inside of the front door. After assessing her work she suggested that I should probably pick up a few more decorations the next time I was at the store. Thanks to the Target Dollar Spot we now have a few other items up, too. Now she’s moved on to Valentine’s Day-inspired treats. She wanted to bake cookies yesterday, but I didn’t have everything I needed to make the ones we wanted. 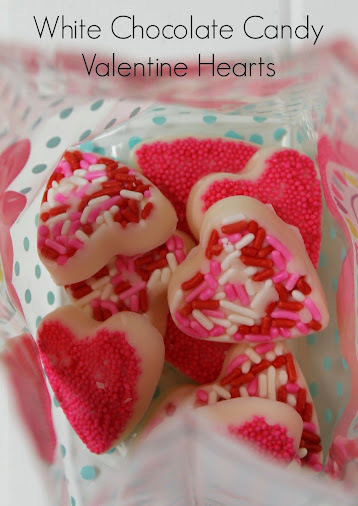 I did, however, have everything that was needed to make some pretty White Chocolate Candy Valentine Hearts. These chocolate hearts are awesome for a lot of reasons. First, there are only two ingredients (sprinkles and white chocolate) and they’re both something you might already have in your pantry. Second, they’re easy for little hands to help with so it can be a family project. And last they taste yummy! Start by filling each well of a silicone mold with sprinkles. 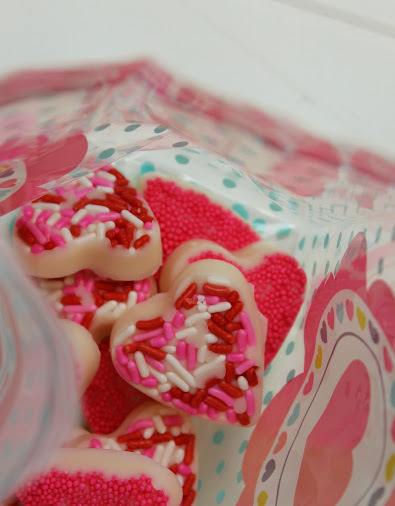 I used heart-shaped molds made for ice cubes that were $1 for a pair last year in Target’s Dollar Spot. Next melt the chocolate according to the package instructions (if you don’t have white chocolate you can also use white candy bark). Spoon the chocolate into a piping bag (or a plastic sandwich baggie) and pipe the chocolate into the wells on top of the sprinkles. Set your filled molds in the freezer or refrigerator until firm. Then just pop them out of the molds and you’re done! You’ll want to make a few batches, some to keep and some to fill up Valentine treat bags and give as gifts. If you’re looking for other ideas to make your Valentine’s Day a little bit more special, I’m sharing a few ideas from my favorite bloggers. Glittered Wine Glasses from How Was Your Day? Who would you like to give homemade Valentine hearts to? White chocolate is one of my big weaknesses! Those look so good! These are perfect for my grandson’s class party! I can’t wait to give them a try.I just bought a bunch of Valentine’s Day sprinkles the other day. Oh, class party is a great idea! I’d love to see yours if you get the chance to try them. These would be perfect to make with my grand daughter. Easy peasy! Yes! Bubbles had a great time helping out. Outside of melting, she was really able to do an entire tray of her own, too. I’ll bet your granddaughter would love making them! These turned out so pretty! I like the tiny round sprinkles best! I am not a huge fan of white chocolate, but these are just adorable. And, I know that kids love the sprinkles!! What a great project to share with little ones. My son would have loved to do something like this when he was little. Plus white chocolate is his favorite! They turned out so cute! My kids will love making these for their friends at school. So cute! I love that there are only 2 ingredients. That’s my kind of treat making! 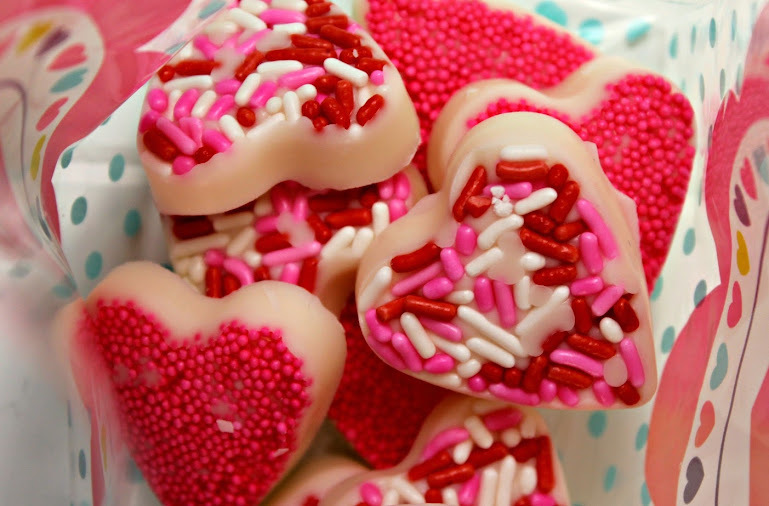 Cute white chocolate hearts – great idea of using the sprinkles. I am going to have to try that – pinned. Oh yum! 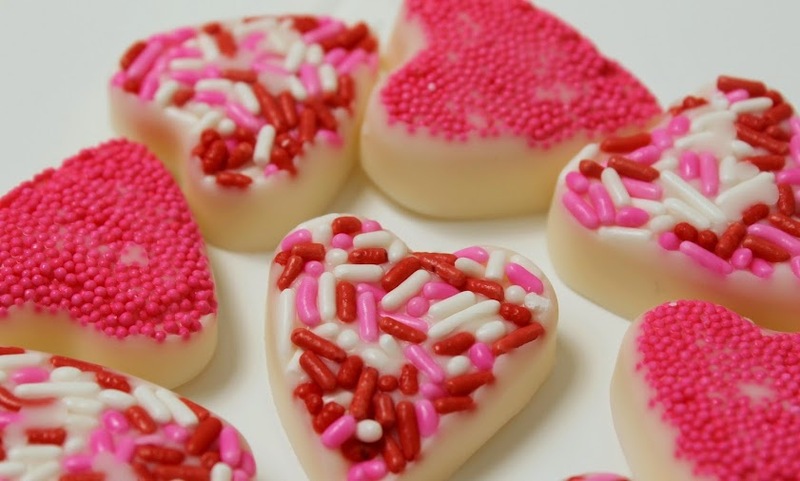 Who wouldn’t love chocolate hearts? Pinned & shared. Thanks for joining in the Inspiration Spotlight party! Have a great weekend. Hi love your post. How fun to make your own candy especially with the kids. You are my favorite featured post of the week, please check us out at Home Cooking. Have a great week. Thanks for featuring me, Linda! I love any opportunity to cook or bake with my daughter, and these really are super-easy. Your hearts are adorable! Thanks so much for sharing with us at Full Plate Thursday and hope to see you again real soon!